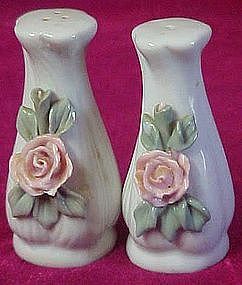 Cute porcelain salt and pepper shakers measure 3" tall and are in perfect condition with no damages. They have their original plastic stoppers. Pretty applied pink porcelain roses with leaves decoration.